TASTY CAULIFLOWER RECIPES START WITH PLENTY OF FLAVOUR AND ENDS WITH EMPTY PLATES. 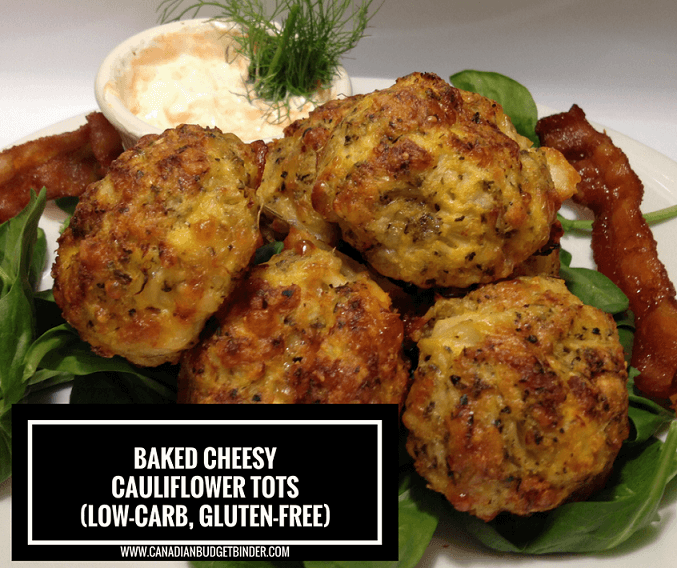 These easy, gluten-free Baked Cheesy Cauliflower Tots are the Italian Arancini balls of the low-carb world. Arancini are rice balls filled with cheese then coated in breadcrumbs and deep-fried or baked served with a side of marinara. They are popular at restaurants as a starter or main meal paired with a salad. For today we’ll forget about those and focus on the low-carb way of switching up our favourite recipes. If you have kids the will love these with a dipping sauce or even a marinara sauce. Kids love to dip everything and if there is cheese inside you know you’ve got a winner. 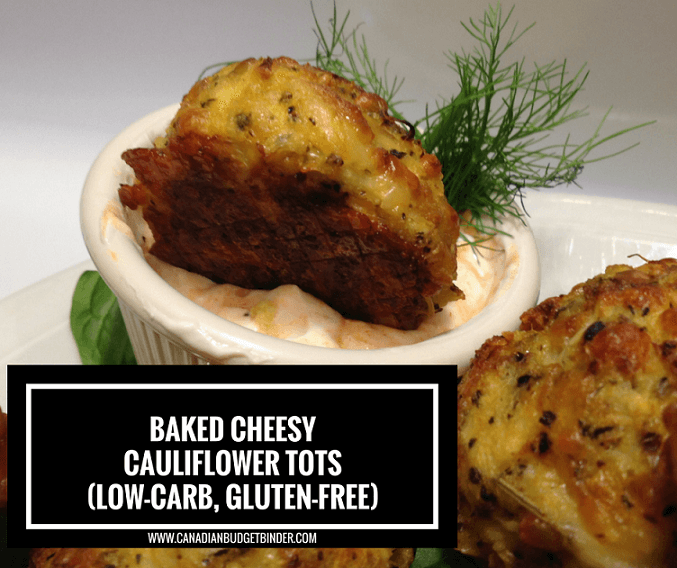 Sometime it’s nice to change-up recipes instead of offering chicken nuggets for example sneak in some Baked Cheesy Cauliflower Tots. Our son tends to get bored if we serve the same foods over and over. We just stare at our son when he does eat foods like this because he’s not a fan of vegetables at all. Delicious cauliflower recipes always start with spices and seasonings because cauliflower is very bland. If you want your cauliflower recipe to shine pack on the flavour, add lots of cheese and bacon is always a good spice. haha! Ya, so bacon is a spice in our family. Low-carb foodies will know exactly what I mean. Cooking with cauliflower is fairly straightforward as long as you remember that it has plenty of water once you boil or steam it. The most important part of using cauliflower in a recipe where you are transforming it is to always strain the water very well. We squeeze our steamed or boiled cauliflower in a cheesecloth to get out as much as the water as possible. If you don’t have a cheesecloth just use your hands to squeeze as much of the water out as you can. 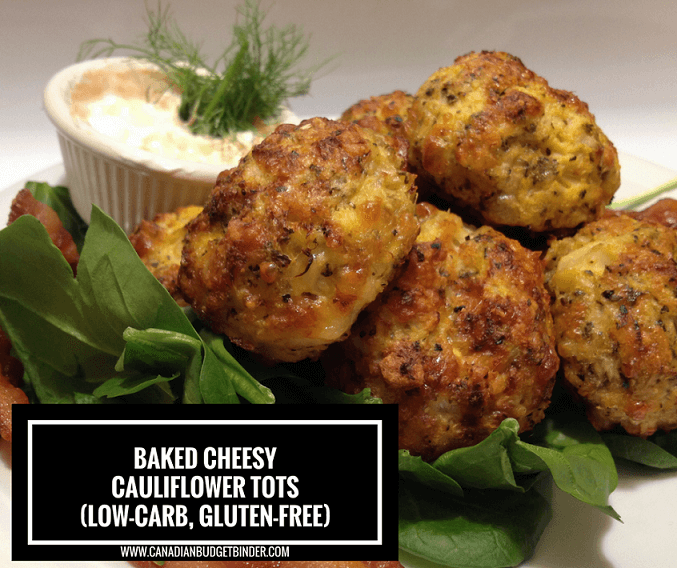 This will help recipes like these Baked Cheesy Cauliflower Tots get crispy on the outside when baked or deep-fried. Since we don’t use breadcrumbs to coat the Cauliflower Tots we brush them with melted butter before they go in the oven. 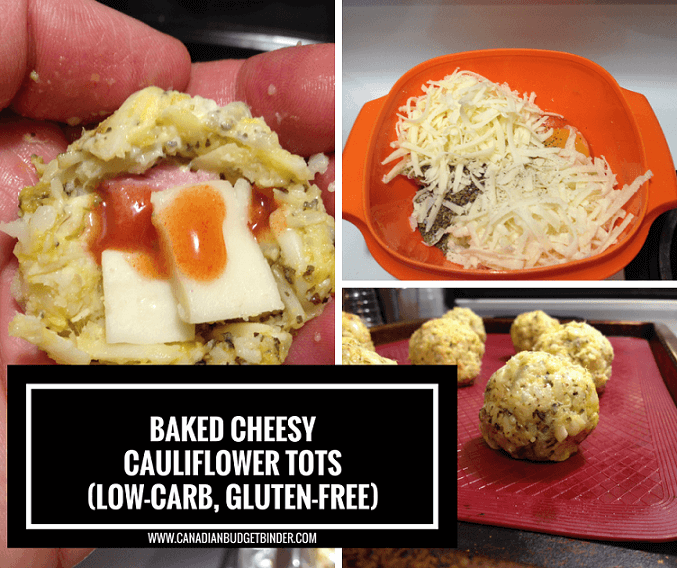 Some low-carb eaters like to crush pork rinds and add some grated cheese and parsley and use this a low-carb breadcrumb alternative. When you mix cauliflower with cheese you end up with a beautiful thing because they are perfect paired together. Creamy cheese with melt in your mouth cauliflower is a typical recipe for dinner-time. It has been almost 2 years since Mrs. CBB started eating a low-carb diet and we’ve been working with cauliflower recipes in all directions. We’ve tested many low-carb cauliflower recipes but only a few make the CBB cut. This means that our recipes have to appeal to us first before we ever share them. We always know that we’ve made something really tasty when we both love it and want seconds, thirds etc. Even better when jr. wants to eat it. The Mrs. was in the mood for something to snack on for dinner rather than a full meal. Since we had a medium head of cauliflower (aprox 580g) to use up we thought we’d give Baked Cheesy Cauliflower Tots a try. They turned out delicious served with a side of homemade dill dressing. This was our little indoor date-night dinner treat while we watched a movie together for our anniversary. When you have kids it’s tough to get out of the house especially when you work 7 days a week. The homemade dill dressing is not our own but we add a splash of Franks Red Hot sauce into the mix. A popular creamy dill dressing that we love has sour-cream, Parmigiano Regianno, fresh dill, Worcestershire sauce, mayonnaise, minced garlic, lemon juice, salt and pepper. We also use this creamy dill dressing in our potato salad and sometimes in our popular cauliflower cheese bake recipe for a change of flavour. Once you’ve mixed all the ingredients together in a bowl you will roll the mixture into uniform balls. The mixture will be comparable to a mashed potato consistency but a bit lumpy and that’s fine. It’s cauliflower after all. You don’t want to puree the cauliflower because it will be a hot mess in your oven. Stop drooling and get baking! Tasty cauliflower recipes don't have to take ages to make nor do they have to be boring and bland. Spice up your cauliflower and you'll never look back. With a cheesecloth add the cooled cauliflower and squeeze as much water out as you can. In a large bowl add all the ingredients minus the mozzarella cubes and mix together until combined. Using a scoop take the mixture, roll and make an indent in the middle of the ball. Add a mozzarella cube and hot sauce if desired. Roll into a tight ball and set on your silpat non-stick baking mat set in your baking sheet. If you don't have a silpat use parchment paper or a non-stick baking sheet. You should have enough mix to make between 8-10 balls possibly more depending on how big you roll them. Make sure the mozzarella cube is covered completely or it will melt out when baked. Before setting them in the oven brush the tops with melted butter then bake for about 15 minutes or until golden brown. 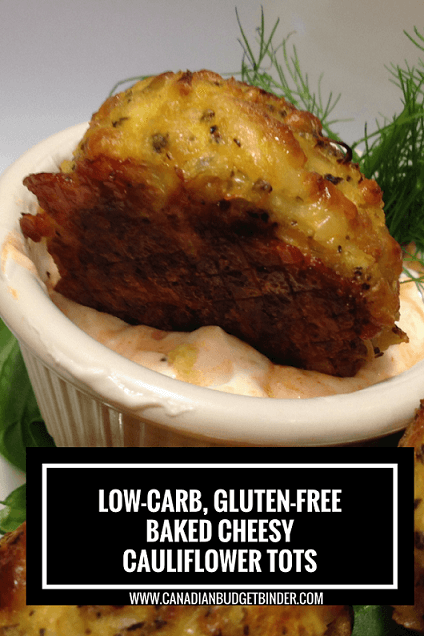 Serve with homemade dill dressing or homemade marinara sauce. In no time at all you will have awesome appetizers for your guests or to nibble on instead of cooking a full meal for dinner. Don’t forget about cauliflower the next time you go grocery shopping as it is a great alternative to serving starchy potatoes and rice. 1/8 Net Carbs 1.7g, Fat 15.37g/1, Protein 119.6g/8 14.95g/1, *Using Atkins Carb Counter /Total Carbs 13.6g or 1.7 carbs per serving. Check out recipe category where you will find loads of other low-carb recipes.